In continuing my DIY kick, I decided to make a few simple bracelets. I've made wire wrapped bracelets (tutorial here) and I wanted to try something different. I spotted a tutorial online (through this website) about painting leather and I really liked the idea. Except instead of paint I ended up using nail polish on colored leather lace. It was a super easy project that took all of 15 minutes or less for each bracelet. I even had most of the materials at home. First I cut a 10mm leather cord a little longer than my wrist. I decided on the colors of nail polish I was going to use and then painted my design. In some cases I would paint one color and then wait for it to dry and go back to paint another color. Once the bracelets were all decorated and dry I took a magnetic clasp (aren't the hearts cute?!) and used E6000 glue to glue the cord in. I trimmed my leather a little more before gluing in the other side. Before wearing it, I let the glue dry for 24 hours. All done! I love the possibilities with colored leather cord and nail polish! These are adorable! You have such great designs, too. 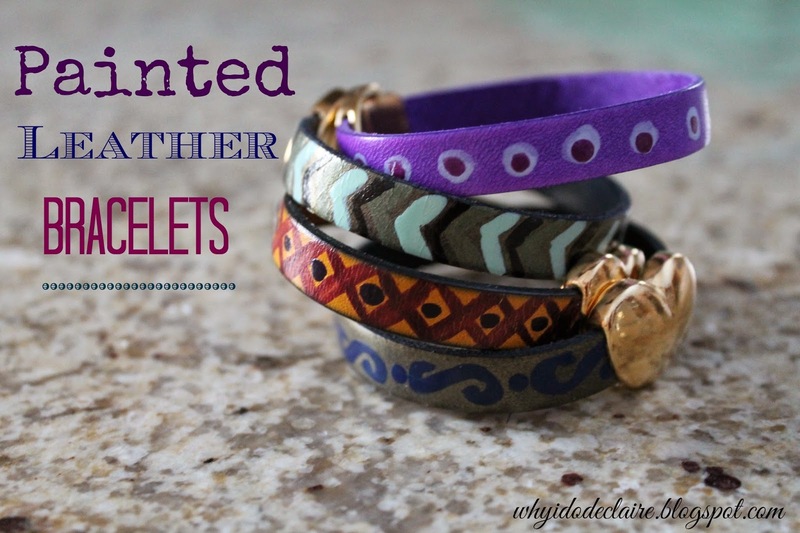 If I attempted this - which I love bracelets, so I may - it will all be stripes and dots because I can't do anything else. Nail polish is a great idea because I have a million colors! These are cute! Did you have to put anything over the nail polish when you were done? Those bracelets are so cute! Using nail polish is genius! these turned out so well! I did a belt with polish once (not recc bc it took forever, hehe). love the designs! they are so cute, smart to use nail polish. These are so cute. Great job. I would have never thought to use nail polish. Too cute, love this DIY Laura! You amaze me with your DIYs. These are so great! Those are so pretty! I wish I was crafty and creative like you! Oh my gosh these are just darling! You make so many great things, I hope you have an Etsy store girl because you really must share your talent! These are so pretty! You need to have another giveaway! ha! ;) I have never made jewelry, but I want to try to make an agate necklace when I get a chance. You should share this over at my Motivational Monday party if you haven't already! They are so cute! What a great DIY idea too! They would look adorable stacked on your arm! :) You are really very creative and talented Laura! You are becoming a DIY queen. These are so colorful, bright and fun!